In the first part of this series, we took baby steps into ConstraintLayout and how it compares to other layouts. In this part, we will go deeper into ConstraintLayouts. Specifically looking into constraints, bias, and chains. Completed part one of the series. As the name suggests, the ConstraintLayout works based on a set of constraints. A constraint is simply a relationship between two components within the layout that controls how the view will be positioned. Every view must have at least two constraints: one horizontal and one vertical. If a constraint for any axis is not added, your view jumps to the zero point of that axis. You can create constraints only between a constraint handle and an anchor point that share the same plane. So a vertical plane (the left and right sides) of a view can be constrained only to another vertical plane, and baselines can constrain only to other baselines. The tools attributes are introduced in order to position elements. Tools attributes are ignored at runtime, so, the button will eventually revert to position (0,0). To properly place this button, and keep it in place, we need to add constraints to it. When you build more complex layouts however, autoconstraints might not give you what you want. In such cases, you are better off creating and manipulating the constraints manually. As said before, when working with more complex layouts, you are better off creating and manipulating the constraints manually. It is important to note that margins only take effect only when a constraint has been added. The margin enforces the space between the target and the source side. Relative constraints are those constraints that allow you to position an element relative to another just like we had in the RelativeLayout. Applying this constraint aligns the view to the bottom part of the view whose ID is referenced, in this case - referenced_view. In the image above, we have two sample text views. The first TextView has a height of 400dp and the second text view has the constraint just mentioned. Notice that the second TextView does not go below, but rather ends on the point the first textview ends? 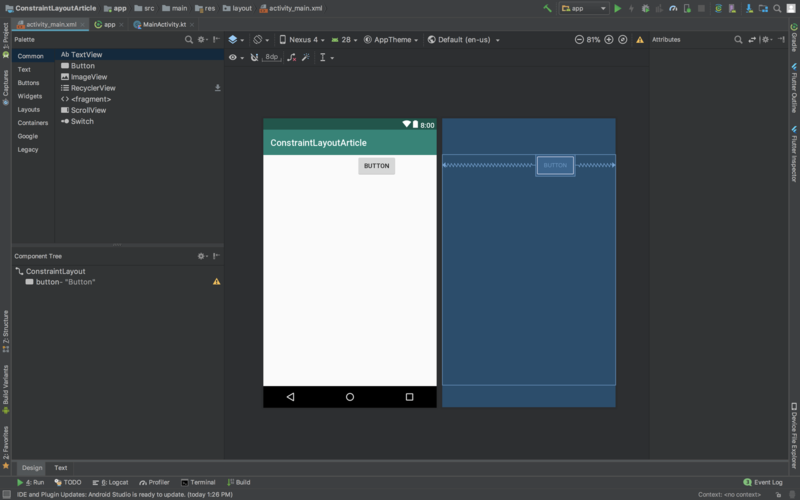 If you want to place a view at the bottom of the layout, you use parent instead of the ID of the other view, something like this: app:layout_constraintStart_toStartOf="parent". This constraint above places a view on the same top starting position as the view whose ID is referenced. In the image above, the first TextView with text - Hello World - is constrained to the parent, so, we were able to add a margin for it. 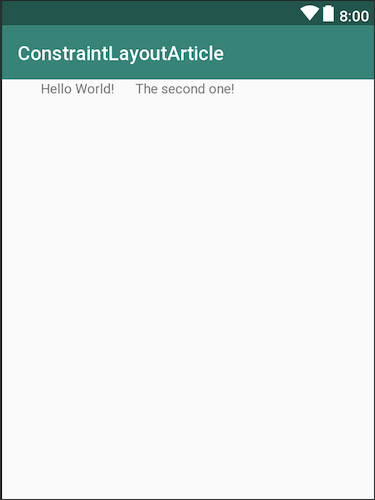 The second TextView has the same constraint to the first TextView, so, it starts at the same point as the first TextView. This constraint places the view on the same start position with the view whose ID is referenced, irrespective of margins. 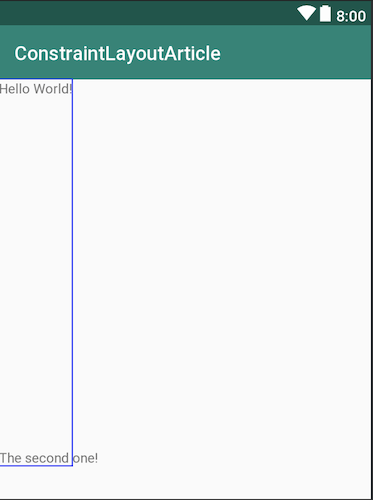 In the screenshot, the first T``extView with text Hello World has a starting margin of 40dp. While the second text view only has the above-mentioned constraint. The second T``extView still starts at the same point as the first. 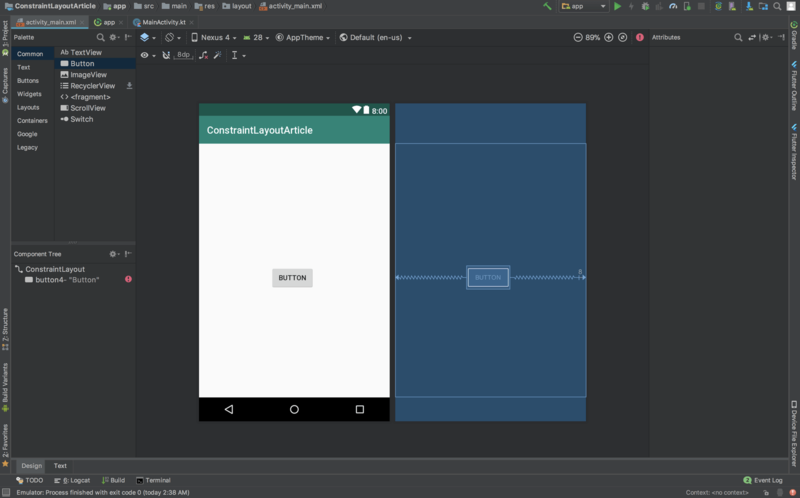 This constraint is similar to the app:layout_constraintLeft_toLeftOf="@id/view" constraint, with the sole difference being that the layout_constraintLeft_toLeftOf constraint always start at the left. The layout_constraintStart_toStartOf constraint could start at the left or right depending on the layout type. For RTL (Right To Left) layouts, for instance, text starts from the right not the left. In such a case, the start constraint will be added to the right. Any view that has this constraint ends at the same point the referenced view ends. 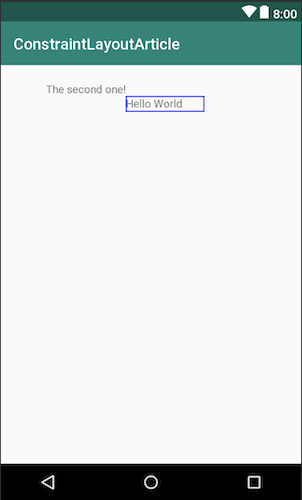 For instance, in the image above, the first TextView with Hello World! has a width of 200dp. The next TextView, which has this constraint, ends at the same 200dp mark just like as the first text. Based on the locale of the user, end could either be to the right or the left of the layout as earlier mentioned. If you are using LTR (Left To Right) layouts, this constraint will give us same result as the app:layout_constraintRight_toRightOf="@id/referenced_view" constraint. This constraint makes a view start just at the end of the view referenced. In the image, the first TextView has a width of 200dp. The second textview, which has this constraint, starts just at the end of the 200dp mark of the first text. This constraint makes a view end at the start of the view it references. In the image above, the first TextView with the Hello World text has a start constraint to the parent with a starting margin. 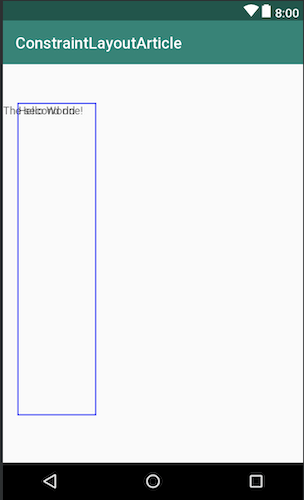 The second TextView, which has this constraint ends just before the first textview starts. This constraint aligns a view to start above the view it references. 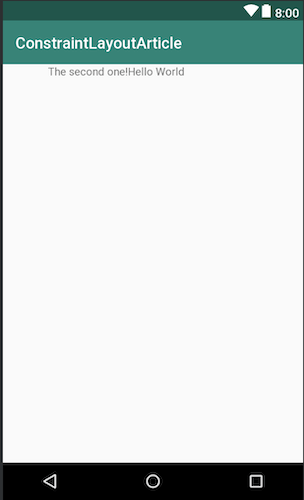 Notice that at the point where the height of the second TextView ends, is where the first TextView starts. Centered constraints are constraints that put views in the center of two elements. When trying to achieve a centered constraint, you add constraints to both ends of the elements. For the button to be centered horizontally, we added constraints to both ends of the parent. You can constrain a widget's center relative to another widget’s center, at an angle and a distance. This allows you to position a widget on a circle. layout_constraintCircle: references the other widget’s ID you want to constrain it to. layout_constraintCircleRadius: the distance to the center of the other widget referenced. layout_constraintCircleAngle: the angle the widget should be at (in degrees, between 0 and 360). It is always best to constrain your views to two views on one axis and use a match_constraint or 0dp. Using wrap_content without a constraint makes your view to overlap on that axis. Bias is used to adjust the spacing between a view and what it is constrained to. They specifically work with centered constraint views and it can be added vertically or horizontally. By default, this button has a horizontal bias of 0.5 even without specifying the bias attribute. Now if you want to adjust this button a little to the right or left, a thing to remember is: values between 0 to 0.4 will nudge the button towards the left of the screen. While values between 0.6 and 1 will nudge the button to the right of the screen. A chain is a group of views linked together with bi-directional positional constraints. The aim of chains is to control the space between views and how the views use the space inside a layout. We have vertical and horizontal chains. Once chains are set, we can distribute the views horizontally or vertically with the following styles. Notice that chain mode is not specified directly through the chain attribute. The spread chain mode is just a product of constraints and bias, two concepts we’ve discussed. The constraint added for the first button makes the button end just at the starting point of the second button. A start constraint was also added to it. The second button has a constraint that makes it start at the end of the first button and end at the parent. Both buttons have a horizontal bias added to them. In this chain mode, the first and last views are affixed to the constraints on each end of the chain and the rest are evenly distributed between them. The first and last button are attached to the parents of the layout, and then the other button is evenly distributed in the center. Above, we see the chain attribute being declared in the first button - app:layout_constraintHorizontal_chainStyle="spread_inside". The constraints used in all the buttons are similar to that being used in the spread chain mode. As seen before, the chain mode is declared in one of the buttons - in this case, the first button. The attribute is - app:layout_constraintHorizontal_chainStyle="packed". Constraints and bias are then added to the views. There are attributes that help to add weights to views when using chains. They are layout_constraintHorizontal_weight and layout_constraintVertical_weight. These control how space will be distributed amongst the elements. To use this attribute, the view must be using match_constraint for either width or height depending on which axis your chain is. The image above is a spread_inside chain mode with weights added to them and we used the layout_constraintHorizontal_weight attribute to achieve this. The first button has a weight of 2 while the rest have a weight of 1. In this part, we have learned about constraints, bias, and chains. We have seen how they relate with each other when creating layouts. In the next part, we will learn about helpers in ConstraintLayout.